Bean was a star this morning, no complaints on the lack of breakfast and quite agreeable in going to MRI at 7:00. He became a little bit quiet as we chatted with the team about his various concerns. He then got quite upset as we had to hold the mask to his face until he fell asleep, but luckily was out fairly quickly. Overall, probably one of our shorter visits to Sick Kids ever – in at 7:00 and out by 10:30! 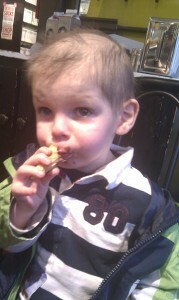 He awoke groggy but very cute and a little bit silly, and has continued in a great mood all day. I wanted to celebrate by ordering sushi, but got overruled by His Nibs, who said, No! We CAN’T order sushi. We have to order pizza! Considering that Gavin doesn’t really eat sushi, I thought it only fair to give way as it is really his day. Ordering pizza is pretty new in Gavin’s world and he gets very excited when the pizza guy knocks on the door. 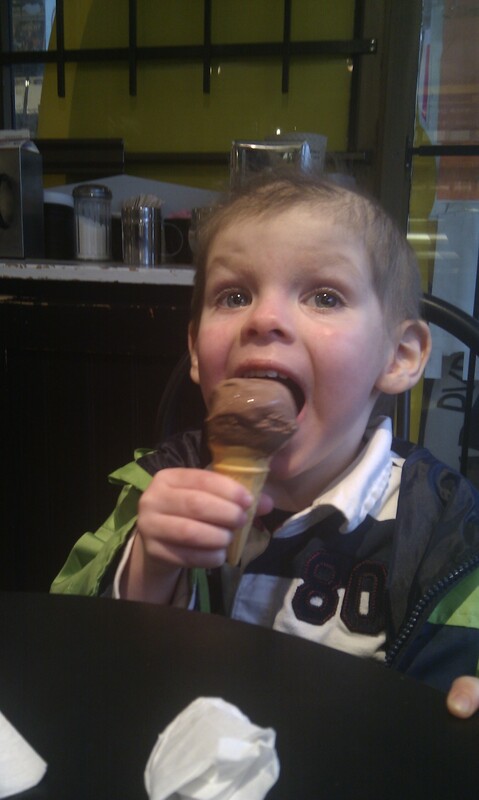 Daddy and I then took him for an ice cream, his first since last autumn. I asked him if he remembered the ice cream shop, and he said “yes” but then later said he wasn’t sure he remembered it. 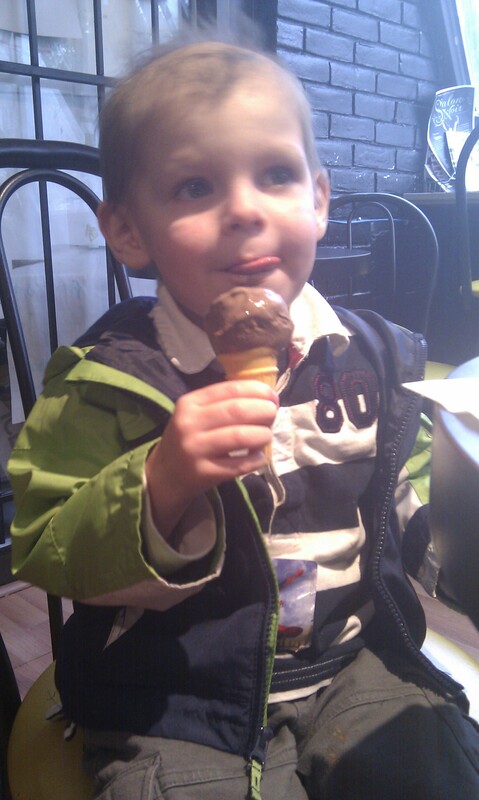 After perusing the flavours, he chose chocolate and had it on a baby cone. To say that he enjoyed it is an understatement. And now for a summer of worry-free fun! And to say that we’re happy about this news is also an understatement, CONGRATULATIONS!!!! Amazing and wonderful. Soxoxo. You’ve said it all!! Yay! Very, very happy to hear the news. Am sure Gavin will be able to lead you to the ice-cream shop next time! I am so happy for you all!! Let’s go for ice cream! Bring on the summer. Gavin deserves some FUN!! Wonderful news, E!! So happy to hear it!! 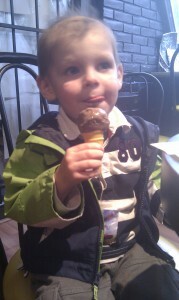 Love the pics of Gav with his ice cream. Here’s to a fantastic summer!! What lovely news……….now next time indulge…..get SUSHI PIZZA! I see many an ice cream date in our future … xxoo ! I see many an ice cream date in our future ! xxoo, Olga. Absolutely wonderful news!!! 🙂 I am so happy for all of you! Yay for the Gavinator! I’m so happy happy happy! Love the ice-cream pictures – he looks so great! Love you all!